Indoor beaconing is going wall to wall. Or more accurately, it’s going from ceiling to floor, as store lighting joins the Internet of Things. The ultimate effect is that the location of in-store shoppers can be very precisely identified and retailers or marketers can then deliver highly targeted, location-based offers, on the spot. GPS has been pretty good at identifying general location and when combined with Wi-Fi and beacons, the combo can paint a pretty good picture of proximity of a person. But now other location technology, along with beacons, is being built into light bulbs. This is yet further evidence that beacons as battery-operated, standalone devices may have seen their day, as I wrote about recently (Beacons, GPS, Wi-Fi Combo: The New Mobile Presence). When installed at retailers, these smart lights can locate a shopper at a precision of 8 to 12 inches and then promotions and other messages can be triggered based on the location. I just spent some time speaking with two of the executives in charge of implementing the connected lights strategy to see how this approach will be used for targeted marketing and advertising. “This is about proximity vs. positioning,” said Gerben van der Lugt, global business development lead for indoor positioning at Philips Lighting, a company that’s been in the lighting business since 1891. Instead of sending a signal to a smartphone, like beacons, the LED lights in a store connect with a phone screen as soon as it is opened. Each light fixture has a unique identification code using what Philips calls visible light communication. A smartphone camera detects the code in the light and identifies its precise location. And that’s where marketing messages come in. As with beacons, the shopper has to have a relevant app, such as the retailer’s where they are shopping. 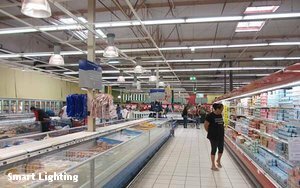 Carrefore installed the Philips location-based lighting system in its hypermarket in France using 800 lighting fixtures. “The retail space is transforming,” said Ravi Koul, marketing director, retail and hospitality at Philips Lighting. “At Carrefore, the app ties into the promotion system so a consumer can select and browse through the promotions. “When they’re in the store, the app opens and the shopper can say ‘show all promotions around me.’” (Koul will be detailing this in a presentation at the MediaPost Iot Marketing Forum in New York on Aug. 3). One of the main differences in using lighting for location is in cost, since to add the technology to the lighting is incremental, rather than having to install separate beacons, for example. The key is that location is becoming much more refined. As with beacons, consumers have to opt in to receive the light-triggered messaging. “People kind of like that as well, since they’re in control of the connectivity,” said van der Lugt. In addition to the lighting-triggered technology, the fixtures can include beaconing technology, so that even while in a pocket or purse, the smartphone location can be identified and tracked. But when opened, the person holding the phone can be located to within a few inches. The Internet of Things is birthing a new state of location.